If you are in the process of looking for a construction company to facilitate the entire process of your project, you have a big decision ahead of you. Your first reaction may be to hire the largest construction company you can find. It is a fair reaction but often misguided. The size of a construction company doesn’t always translate to the size of your project. Many mid-sized construction companies can handle sizeable jobs more efficiently. This has been especially true due to the recession. While we are sure you’ve been wanting to forget the market collapse in 2008/2009, the fact remains that it created lasting impacts on a number of industries, one being construction. When the market collapsed, numerous construction workers lost their jobs. This was across the industry from electrical workers, to sheet metal workers, to masons. Many others in the construction industry chose to leave because all signs pointed to a very slow recovery. Overall, approximately 50 percent of the construction industry labor force left after the recession. In the Chicago metro area, construction workforce dropped dramatically from 29,600 in 2008 to 18,100 in 2011. Currently, we are sitting at about three-quarters of what the workforce was pre-recession. For some companies, the shortages are manageable but only due to non-traditional methods such as employing the workforce before projects are started, pulling in “traveler” workers from other cities and states, guaranteeing overtime, and directly employing craft workers. Unfortunately demand for construction is only expected to increase making labor shortages more problematic in the near future. Additionally, the workforce is aging with the median age of the construction worker up to 40 in 2010, as opposed to 37.8 in 2000. A huge reason for this was due to the stoppage of 90 percent of apprenticeship programs. While many programs are back in full swing, the output isn’t immediate. As you have probably surmised from the labor shortage facts, choosing a construction company can have a significant impact on your actual project even from a labor output standpoint. If a construction company has low labor numbers and higher project counts, you can see where this would become a problem in terms of delays. This has created a tendency for a much slower turnaround time on projects. The labor shortages make hiring the right construction company even more important. It is crucial for companies looking for a construction partner to choose someone that is well versed at planning and managing construction projects. Proper planning and management is truly the only way to meet construction turnaround times while remaining in budget and keeping quality at the forefront. Our advice to you while looking for a construction company for your next project is to obviously contact us, but also check the number of superintendents versus the number of job sites a construction company is handling. By doing this, you can get a good picture of the company’s workload and if they would be able to manage your project. The Construction industry is constantly evolving, with new technology, new IT systems, better and more efficient practices, and even generational differences in employees and recruits. It’s easy to go about your day-to-day business, but it’s vital to step back occasionally to look at the big picture—how are things changing, and how does your company need to adjust to the changes to be successful? Steven Lamp, Secretary/Treasurer of Lamp, recently attended the Associated General Contractors of America (AGC)/Construction Financial Management Association (CFMA) conference. We love the opportunity to keep Lamp at the cutting edge of what is happening in construction, the financial implications, and how we as a company can establish best practices within the industry. Steven had so many takeaways from this valuable session. Here are just a few pivotal current trends and risks worth the construction industry’s attention. 1. Succession and Labor is changing. As the construction industry continues to grow stronger, new labor joining the industry doesn’t seem to be keeping up with the trend. The older generation is retiring, so it will be important to focus on recruiting successors. Equally important will be training them so they are prepared. Recruitment and training alone could put your company at a competitive advantage. 2. Acceptance of change within an organization is important. We live in an age where everything is changing—technology is changing everything. As a result, IT changes, efficiency systems change, and the way we do everything changes. Your organization must be positioned to embrace change. To do this, you must effectively communicate with your organization. People have a natural tendency to reject the new. You can shift that tendency through your communication—focus on the value of change, answering “why” questions. The more the organization understands why you are doing things, the less fear they will have. Also, those who are affected by change should be involved in the communication. You can build up a well of support if you communicate effectively. For more construction industry trends and updates, join our eList below. Solar has been in the commercial construction sight line for years, but it has recently taken a big leap into the spotlight. In March, Whole Foods announced that it would cover one-fourth of its stores with solar panels. This makes it among the 25 biggest commercial solar suppliers. Walmart, Apple, General Motors, Walgreens, and Target also fall into this category. Reducing costs. Whole Foods chose to undertake this huge construction project for both environmental stewardship, and to reduce energy costs. The Solar Energy Industry Association (SEIA) says that in 2015, solar systems for commercial businesses reduced every quarter in 2015, with the final cost 10% lower by the end of the year at $2 per watt. According to the SEIA, “While solar has long been viewed as an environmentally responsible energy choice, businesses now deploy solar because it is a smart fiscal choice as well.” According to the Illinois Solar Energy Assocation, photovoltaic panel costs are all up front, and then the energy is free and insulated from utility price increases. Only maintenance costs need to be considered. It’s popular. When you go solar, you aren’t the only one. In 2015, for the first time ever, more solar energy systems were installed in the U.S. than new natural gas plants. Solar supplied 29.5% of new energy sources built last year. It can be installed in a variety of ways. 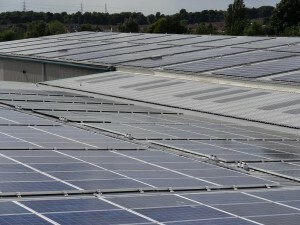 Solar is available for a huge variety of building and facility layouts. According to the SEIA’s report “Solar Means Business”, companies are using it in office buildings, corporate campuses, retail, manufacturing, data centers, distribution centers and warehouses, convention centers, and more. And of course, environmentally friendly. The energy produced from solar electric systems is clean, carbon free, and non-polluting. What Are the Future Benefits for 3D Printing in the Construction Industry? Since its advent, 3D printing has been on a steady path forward. And the further along it moves, the more people have been wondering how it will affect and benefit all industries. In 2015, China managed to 3D print homes and other large-scale structures, making everyone pay attention to the possibilities for 3D printing in construction in particular. 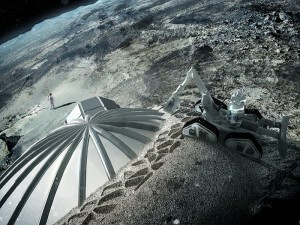 New Shapes and Design Possibilities: 3D printers allow an architect to be totally flexible in the shape of his designs. 3D printing can build curvilinear structures (rather than rectilinear forms). Using a concrete and composite mixture, 3D printers can build these curvilinear structures, which offer the strongest structural design, especially compared to the limits of rectangular forms. Lower Costs: Costs could be lowered on both a large structure scale and with regard to parts. On a large scale, 3D printed buildings would have potential for far lower materials costs and labor. This could be especially applicable and helpful in 3rd world countries, where better homes could be built for less. And regarding parts, 3D printing would allow spare parts to be printed from any location by any manufacturing company. This could lower both the cost of the part and the time it takes to receive it. 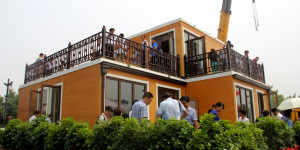 Check out this video showing some of the low-cost 3D printed houses in China, which can be produced for less than $5,000. 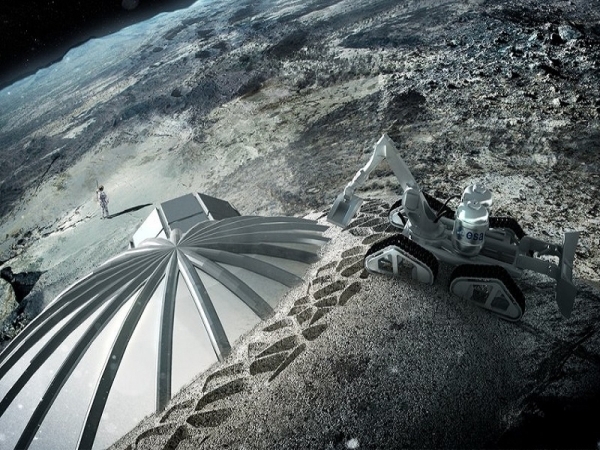 Remote Location Construction: And in a totally bizarre and out-of-this-world use of 3D printing, the European Space Agency is considering building a 3D printed lunar village on the moon using lunar soil. This construction could begin in 5 years. And it proves that 3D printing could take us anywhere—there is no application too wild. More Precise Building: According the managing director of Facit Homes, which is building a 3D Printed Home in London, a 3D Printed home has better and more precise results because a file is passed from a computer to a machine, and is never touched by human hands, so it is never up to interpretation. The file translates directly to an object. As 3D Printing use in the Construction Industry is in its early stages, it is still too early to tell what will happen. But it’s exciting to watch the change and imagine the future possibilities! https://lampinc.net/wp-content/uploads/2019/01/Lamp_Logo_Color_B-copy-300x132.png 0 0 sg-lamp https://lampinc.net/wp-content/uploads/2019/01/Lamp_Logo_Color_B-copy-300x132.png sg-lamp2016-01-08 16:21:582018-01-18 19:23:24What Are the Future Benefits for 3D Printing in the Construction Industry? Is Geothermal Energy Actually Effective, and Is It Here to Stay? Here at Lamp, we believe in the power of building green. 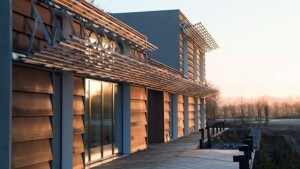 Healthier buildings can lead to happier people and a healthier environment. On top of that, green building practices provide our clients with surprising (and lasting) financial savings. We’ve noticed that geothermal energy has been heating up lately. Is it for real? And is it a flash in the pan, or is it a cornerstone energy source for the future? Let’s take a look. How effective is geothermal energy? Well, we’ll answer that question with another question: How much do you know about the earth’s core? Probably enough to know that it’s really powerful and really hot. Geothermal energy taps into the essentially limitless power of our planet’s core. So whether we’re talking geothermal or solar power, harnessing the renewable potential of heat is a great way to effectively produce energy. We’re certainly not the first to examine and implement geothermal power. 19 out of every 20 buildings in Reykjavik, Iceland’s capital city, use geothermal fuel. It’s no coincidence that it’s one of the greenest cities on earth. The benefits are green in multiple ways. According to research, a correctly-installed geothermal energy system reduces a building’s utility costs by up to 60%. That’s an eye-opening number. Is geothermal power here to stay? It sure looks like it. Geothermal energy doesn’t require much additional real estate, meaning its small footprint is well equipped to power crowded urban areas. It has exciting job creation potential for engineers, electricians, geologists, and more. It’s highly scalable, low on carbon, and getting easier to harness every day. Perhaps most exciting of all, its constant core temperature allows for a more efficient heating and cooling system than conventional HVAC systems. Add that to the fact that the cleanliness of geothermal power makes the system easy to maintain, and it’s easy to see that switching to renewable is more cost-effective over the long term than traditional energy methods. A better future is being built, and it’s truly exciting. Want to learn more about Lamp, Inc.’s green efforts? https://lampinc.net/wp-content/uploads/2019/01/Lamp_Logo_Color_B-copy-300x132.png 0 0 sg-lamp https://lampinc.net/wp-content/uploads/2019/01/Lamp_Logo_Color_B-copy-300x132.png sg-lamp2015-09-30 16:15:312018-01-18 18:17:17Is Geothermal Energy Actually Effective, and Is It Here to Stay? At Lamp Inc, we’re proud to complete building projects with four simple words: “On time, on budget.” This is largely thanks to our team, but we also have to give credit to technology and the way it’s made our jobs easier. If you’re hoping to catch the start of the tech boom in construction, you’ll need a time machine. We’re in it. The boom is here. Combine that with the increased focus on the environment, and it’s apparent that we’re in the midst of a building phase that’s unlike anything that’s come before it. Here are a few trends we’ve spotted recently. And to add a little fun, we also threw in a few predictions too. 1. It starts with the equipment. Cars aren’t the only things minding fuel efficiency and emissions standards. The push for environmentally-conscious construction equipment is significant. And as with many green trends, there’s a twofold benefit if utilized correctly. Obviously, machinery with reduced footprints helps Mother Earth. But spending less on gas can help the wallet get a little greener, too. 2. Residential and commercial buildings will get passive. We’re busting out our crystal ball for this section. Passive spaces are growing steadily in Europe, and they’re just now starting to gain traction here in the States. The design process is completely integrated with the architectural design of the structure. The result is an extremely low energy building that requires a fraction of the heating and cooling that a standard structure would need. Does living in a broom closet sound appealing to you? If so, you might be a Millenial. The cost and carbon footprint of living in a micro-apartment are fittingly microscopic. This is a trend that’s going mainstream, so you’d be wise to adjust now. From coast to coast, cities like Boston, Nashville and San Francisco have begun to approve these diminutive nests. 1. 3D printing is real, and it’s spectacular. It’s not hyperbole to claim that it might be the future of construction. We’re a notoriously conservative industry, of course, so it will take time to really see 3D take off here. But when it does, look out. We’re talking faster project planning, happier clients, and massive financial and environmental savings. 5. Geo-fencing can change the payroll game. Know what’s not easy? Figuring out who gets paid what. Know what’s way easier? Letting an app do it for you. A geo-fence (you can tell it’s a new word because it’s still hyphenated) is a digital barrier. It uses GPS to track objects (like cell phones). That means we can instantly know when employees are on- and off-site. Magic. What other trends have you seen? What’s your big prediction for something we’ll see next?